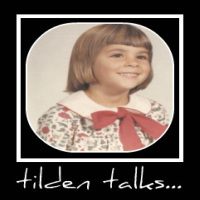 tilden talks...: Spring Forward with Scotts Florida select Mulch! With Spring just arrived here in the Northeast, folks are gathering up their gardening supplies and raking lawns and flower beds in preparation for the warm weather and the short growing season. Early planning and preparation ensures the longest season possible and an early start makes everything that comes after worthwhile. I start with my rakes and wheel barrow and theone thing that makes a good garden great: mulch. I love dark mulch. I love the way it brings out the color in all my flowers, annuals and perennnials alike. Mulch is also a must have for my vegetable garden. keeping down weeds is super important to me because the last thing I want to do after a day at work is weed. Mulch is essential to me. 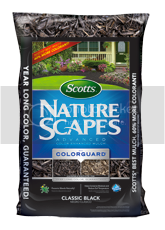 I'm interested in Scotts Nature Scapes mulch. I like that it is made from natural forest products, no waste wood is used. It also comes in great colors and and avariety of textures. Last week I spoke to my brother, Pete, who lives in central Florida. His growing season is much longer than mine for vegetables, but he grows flowers and shrubs all year round. 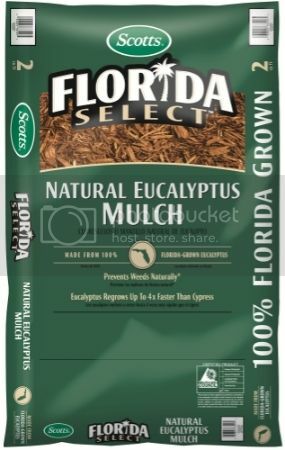 Pete says he's been having great success with Scotts Florida Select Natural Eucalyptus Mulch. While telling me about Florida Select, he metioned his commitment to sustainable gardening and how Florida Select fits his sensibilities perfectly. He chose this particular mulch because it is sustainably harvested and plantaion grown. because it is grown locally, it helps the economy in his neighborhood. Mulch helps retain soil moisture and regulate the temperature of the soil while keeping weeds down without chemical applications.